Deep frying your own Thanksgiving turkeys and sharing with loved ones is a wonderful experience for many families. Knowing that you’re in control from start to finish is indeed gratifying. The marinade used, quality food ingredients, trying out new flavors – you are in total control. This brings us to the question of electric turkey fryer vs propane turkey fryer. Pros and cons? Read on! At the end of this article, you’ll be able to decide whether to go electric, oil free or propane. If you love the aroma and taste of fried turkey, then you will be inspired to master the art of deep frying turkey at home. It is indeed a delicious tradition to follow. 2.5 Oil Free Outdoor Propane Turkey Fryer – How Does The Outdoor Oil Free Propane Turkey Fryer Work? 3.1 How Does The Electric Turkey Fryer Work? 5 Electric Turkey Fryer vs Propane Turkey Fryer – Which One Is For You? Turkey fryers come in oil free models as well as the traditional deep fat fryers using oil. Both the electric or propane turkey fryers have either the oil or oil free options too. There are 2 types of outdoor propane turkey fryer, those using oil and those that cook without oil. Hanging out in the backyard (with buddies) while keeping an eye on the turkey frying inside the hot oil in the pot can be a fun, joyful and relaxing experience for many people. If you buy the complete outdoor turkey deep fat fryer kit, it comes with everything you’ll need to deep fry your turkey. 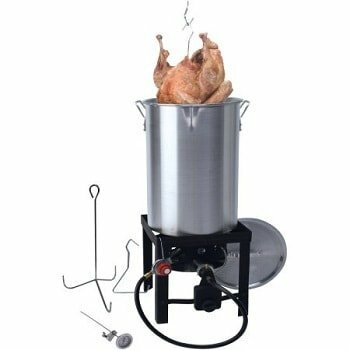 The basic turkey fryer kit that uses oil consists of a 30 – 40 fryer pot (aluminum or stainless steel) with lid, frying basket, lifting hook for lowering and raising turkey, as well as a burner with gauge for regulating the flame. If you’re looking for an extra large pot, check out the Bayou Classic 82 qt stockpot boiler. Some fryer pots come with integrated drain valve for easy removal of the used oil. You’ll need to get your own propane gas tank, clip on thermometer to check oil temperature, instant read meat thermometer, heat resistant long thick gloves, well insulated potholders, injector for marinades, timer, fire extinguisher and don’t forget your peanut oil. Safety googles to protect your eyes from oil splatters are recommended. Normally, you’ll need about 3-5 gallons of oil with high smoke point. Make sure frozen turkey is thoroughly thawed and as dry as possible outside as well as inside before lowering it into the hot oil. Splattered or spilled hot oil can be dangerous. Giblets and neck have to be removed before deep frying. Use them for a tasty gravy. Never overfill the pot with oil. To check for maximum oil level, first put the bird (minus the packaging) into the empty fryer pot, fill it with water until water just barely covered the top of the bird. This water level must be about 4 -5 inches below the top of the pot to prevent oil from boiling over. Then removed the bird and mark the water level. That’s the maximum level of the oil you’ll need to pour in. Get an instant read meat thermometer. Temperature must reach 170-180°F at the thickest part of the thigh and 165-170°F in the breast for turkey to be considered cooked. To prevent fried turkey from sticking to the basket, first dip the empty basket in oil or spray with non-stick cooking spray. If you wish to brine your turkey, do it 6-12 hours in advance. Always make sure the bird is thoroughly dried before deep frying. If injecting water based marinade, best to inject deep into the breast and thigh muscles. Injecting just under the skin might result in oil splattering when water mixes with hot oil. If stuffing is used, cook it separately. Deep frying is a fast-cook method and stuffing might not have enough time to get properly cooked. Besides, you need the oil to flow freely around the cavity of the turkey for it to cook evenly. After removing fried turkey from hot oil, let stand for about 20 minutes. This is to allow for the bird to finish cooking, drain out excess oil as well as allow for the juices to set. For best results, get the turkey weighing less than 15 pounds. For safety reasons, it’s easier to handle a smaller size bird. Frying turkey larger than 15 pounds takes a longer time which might result in overcooked skin. Oil Free Outdoor Propane Turkey Fryer – How Does The Outdoor Oil Free Propane Turkey Fryer Work? Let’s talk about the Charbroil Big and Easy oil free turkey fryer. The propane oil less infrared turkey fryer uses radiant heat to cook your bird. It comes with a double wall construction with an internal cylindrical cooking chamber. It is powered by a 20 pound propane gas tank and has a circular gas burner heating up the space between the double walls. The gas flames heat up the interior wall. Infrared heat radiates evenly from inner wall to penetrate the bird. Hot air rises along the inner wall and exits at the exhaust holes. Turkey remains moist and juicy. Its infrared technology enables faster cooking with less gas needed. It is able to maintain even heating resulting in food with a crispy exterior and a juicy interior all done without the need for oil. If you love turkey drippings, then you’ll love the removable drip pan located at the bottom of the fryer that catches the drippings for making your gravy. As for the electric turkey fryer, you can choose between oil free or using oil. It can be used indoors and it can be placed on the countertop. There is no open flame to worry about. Digital electric turkey fryers come with thermostat control, timer and user-friendly digital controls. Safety features such as temperature control and auto shut-off make them safe and easy to use. A green light informs you when the desired temperature is reached. Besides frying your turkey/chicken, it can be used for low country boils, steam/blanch vegetables, French fries etc. The heating element has to be submerged in either oil or water – deep frying or steaming/boiling. Some models come with a divider for the frying basket that allows you to deep fry 2 different food ingredients at the same time. Are you looking for an electric turkey fryer with spigot or drain valve? This makes it easy to drain off the used oil. How Does The Electric Turkey Fryer Work? 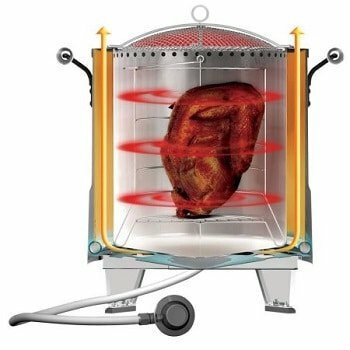 The electric turkey fryer comes with an adjustable electric heating element to cook your bird. For example, the Butterball oil free electric turkey fryer is powered by a 1650 heating element. It comes with a double-wall construction that uses radiant heat to seal outside of turkey. It takes about 10 minutes per pound of turkey. 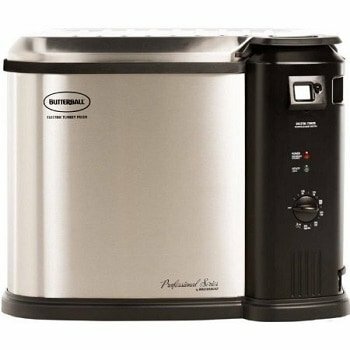 The Butterball XL Electric Fryer by Masterbuilt (uses oil to fry) is powered by an adjustable 1650 watt electric heating element. It takes about 30 – 45 minutes to heat up the oil in the pot. It takes about 4 minutes per pound to cook the bird if using the electric fryer with oil. It comes with a dishwasher safe fryer pot, lid, basket as well as drain valve. Yes, everything goes into the dishwasher except the heating element. Safety features include thermostat control to maintain a steady temperature up to 375°F and an auto shut-off when temperature of oil gets too high. There’s an in-built timer to let you know when turkey is ready. The electric fryer uses 33% less oil than the traditional fryer. The indoor electric turkey fryer uses less oil compared to the outdoor propane deep fat fryer – a little under 3 gallons or 11 quarts compared to 4 – 5 gallons for the outdoor fryer. However, you can only cook a smaller turkey (up to 14 pounds) using the electric turkey fryer with oil. You can cook a slightly larger bird up to about 18 pounds using the oil free electric model. You won’t get drippings for making gravy unless using the oil free fryer. It takes about 10 minutes per pound of bird. So an 18 pound turkey would take about 3 hours. The greaseless turkey fryer is great for you if you are afraid to deal with a big pot of hot oil and an open flame. You have a choice of either the outdoor propane oil-less turkey fryer or the outdoor electric oil-free turkey fryer. Certain models come with the built-in wood chip box for a smoking effect. With the oil less turkey fryer, you get to collect drippings for gravy. Because no oil is involved, you get to season your turkey with your favorite rub and spices. Make sure the fryer is heated up before putting in your bird so that the skin is instantly seared and the moist juices stayed inside. Do not cover the cooking chamber with its lid when cooking is in progress. This is to prevent overheating causing dryness. Cover the fryer during last 15-20 minutes for a crispier skin and a more golden color. A propane gauge comes in useful for checking the amount of gas left in cylinder. 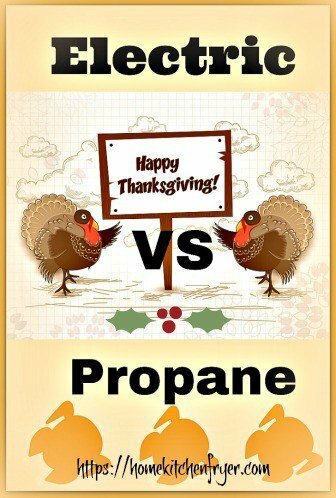 Electric Turkey Fryer vs Propane Turkey Fryer – Which One Is For You? If you’re looking to maintain a healthy lifestyle with less fat in your diet, then the oil free electric turkey fryer would be the better option for you. If for whatever medical reasons you’re advised not to have deep fried food, then the oil less turkey fryer might offer you a solution to having fried turkey for Thanksgiving. If you do not have a safe place to deep fry using a big pot of oil, then you’ll find the oil free fryer appealing. If outdoor cooking is not an option for you, then the indoor electric turkey cooker would be your choice. You’ll just have to narrow it down to turkey fryer with oil or without oil. If you have small kids and pets running around, do consider the indoor turkey fryer. If you’re reluctant to handle a big pot of hot oil, you can still cook fried turkey at home using the electric turkey fryer with no oil needed. Or you can use the electric indoor turkey fryer that cooks with less oil, comes fitted with safety features, temperature control and is easier to handle than that big pot of oil powered by propane. One good thing about the outdoor fryer is that your house interior doesn’t smell of oil. It’s a great appliance to have when cooking for large gatherings of friends and loved ones. So, think indoor or outdoor, then choose with oil or without. If you worry about the amount of oil in your fried bird – The modern turkey deep fat fryer with temperature control feature helps maintain oil at the ideal temperature throughout the cooking process. This helps in minimizing oil absorption into the bird. Too low a temperature results in greasy food and too high a temperature results in a burnt crust. If you worry about the taste of the oil free fried turkey – Majority of customers commented that the oil free fried turkey taste delicious with a crispy akin and juicy meat. Cooked turkey cannot be left at room temperature for more than 2 hours.